Not all campervans are created equal. Many classic campers go through various ‘costume changes’ as different owners try to create the ideal motorhome and, over time, even the most vintage of VWs can go from classic interior to decked-out modern machine. However, North Yorkshire company, eDub Trips, have gone one step further. Converting classic vehicles into all-electric campervans, they have transformed an old favourite into the new, eco-friendly face of campervanning. The petrol tank is now a battery pack, the engine an all electric motor and, combined with it's bright and eye-cathcing paintwork, there's no denying this is a truly green machine. The idea behind eDubs came about three years ago, founder Kit Lacey tells us, with a conversation between him and his mother, Gilly. 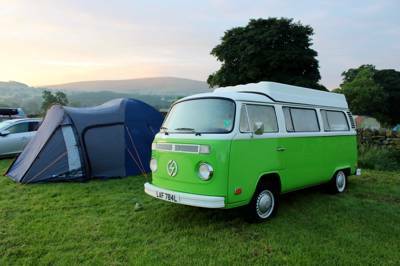 "We were simply speaking about taking a classic 70’s camper and replacing the engine with an electric drivetrain", he explains. "How hard could it be?". The answer wasn't something that every mother and son team would be wise to apply themselves to, but Gilly's PhD gives a hint at where their expertise in the matter would come from. A doctor in Lithium Ion Battery Degradation and Vehicle to Grid Application, she certainly has a pretty good idea of what creating a product like this takes! With the engine ripped out and a giant space where the campervan petrol tank used to be, they set about working in the new all-electric motor. The choke would be replaced with a simple eco-button and a new set-up configured to work with regular campsite hook-ups. "The first few years", admits Kit, "were not as easy as expected", but eDub Trips did successfully take their first VW and transform it into the eco-beast they had planned. With zero emissions, twice the bHp of a traditional campervan and the ability to re-fuel simply by hooking up to a campsites standard hook-up cables, their bright idea has been thoroughly well received by the camping community. Launching at a time when even VW themselves have stepped up their talk on electrical vehicles, fans of the classic bus are eager to see the changes they have in store. Responses to the VW BUDD-e concept van so far, however, have been somewhat muted. Is the eDub the revolution that campervan fans worldwide have been waiting for? Only time will tell.